I rarely ever show a work in progress and it's not because I'm terribly secretive but sometimes I feel sharing a finished work with you presents a sense of finality. This is far from final. The quilt top is a spin-off of Bee Beautiful's (quilting bee) charity quilt. I started making the blocks for Rebekah's project (originally inspired by Film in the Fridge) and I knew I wanted to make my own quilt using the same fabrics, in the same style. I was literally seeing stars after I made my charity blocks. I'm serious, these stars burned my retina. I finished the top over a month ago but haven't yet basted it because I don't know how to quilt it. I am not comfortable with free motion quilting (but I try). I have seen some great star quilting here, here and here. But I just don't know! Should I put a border on it like this one? I am at a loss and I want to finish it. ~ I appreciate your feedback... now go make something! p.s. Have you ever seen so many links in one post? I love it! 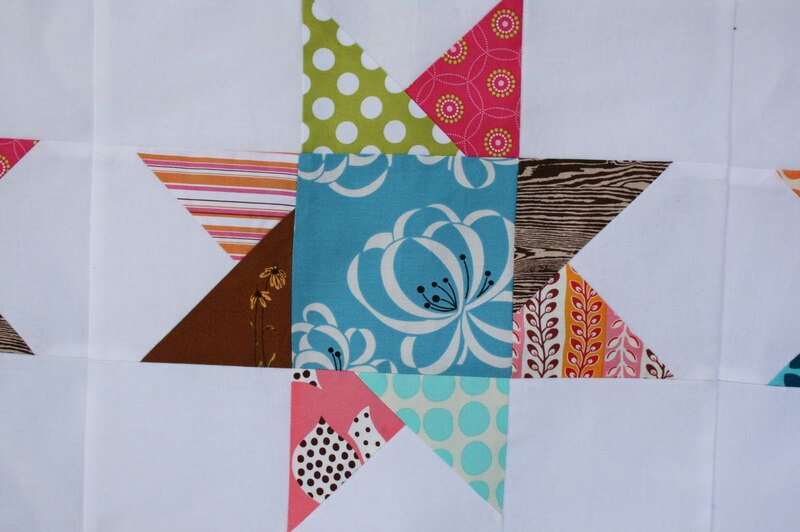 I love the different fabrics for each step of each star. I do love the look of that border you linked too, which seems to finish if off nicely. You could also add a couple borders, depending on how big you want it to be. You could had a white border to make the center bigger and then add a color border. Or white and a color binding. Or, oh, the possibilities! I also really like the way Ashley quilted it, but I also love Susan's quilt too, which really made the stars pop out. I'm so happy you shared this work in progress with us cuz it's fun to see what you're working on, and provide feedback (since you asked). It really is gorgeous! This quilt top is so cool! Thanks for sharing! Love it! I have plans to make one too, three blocks definitely weren't enough. I really liked the last link for the quilting, more free form. But all were nice. The border idea is nice, it does frame it well. You could always make a scrappy border using various scraps matching your stars. Good luck figuring it out, happy sewing! 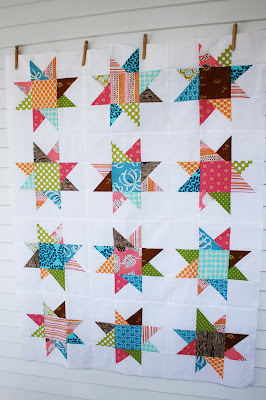 i really love the border and the random quilt wherever straight lines is so pretty. I loved all your links! I've been working on a wonky star quilt and have put it on the "back burner" temporarily but this has inspired me to get it back to the front of the line! 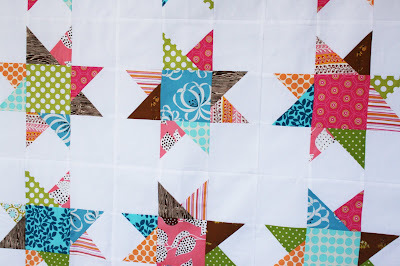 I loved the random straight line quilting and the border rocks! But I would love it just as much without it. Hmmm ... no help there, am I?! I don't blame you for making your own! I've made a few star quilts and each time I stippled them... I do like the random lines though. And the border is very, very cute! I'm going to have to do that for my next star quilt. 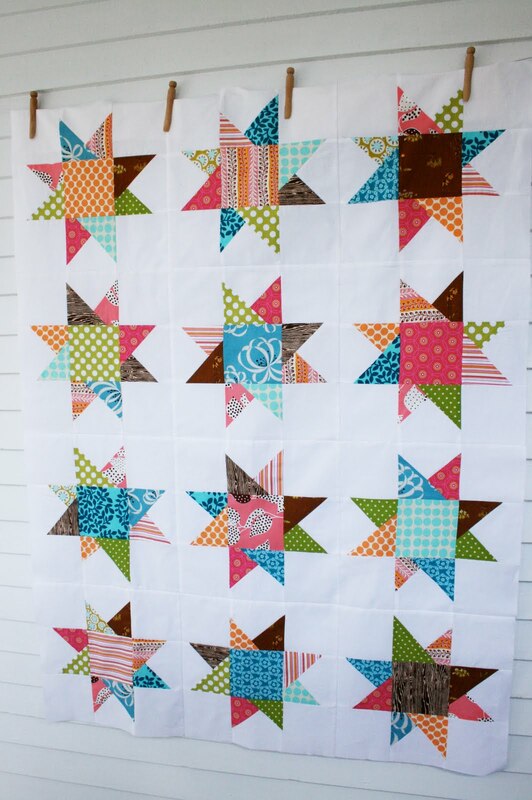 Erica, that star quilt is FABULOUS! I love it!!! And I really like the border you linked to, and the way that one was quilted. I'm sure that whichever way you decide to go, it's gonna be great! I like the pink border, but I think a narrow 1/2" or 1" border inside that one would be really cute - and line quilting for sure, either straight lines, or like film in the fridge did.... What are you going to do for the back? your top is just fabulous...your fabric combination is stunning!! I love straight lines so I would vote for them. Maybe set them up so that they frame out the stars. I also am a big fan of borders...it alway adds a subtle but framing effect to the center of the quilt. No matter what you do...it will be awesome! Love the stars. I think a border would be good. How about echo quilting around the stars? I'd quilt it with simple lines all over. It is so beautiful. I am not great with machine quilting so I don't hav any advice to give. I love it! I wouldn't add the boarder - but would use a dark/pieced binding. That is a really great star quilt! oh Erica, it's so bright and cheery! hmmm, how to quilt it. how about something simple like a crosshatch? love this! 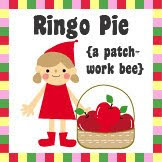 That is so fun that you made a quilt based on the bee beautiful quilt. and the awesome keeps coming! This is amazing! We can't wait to see the finished project. Thank you for sharing your lovely blog; keep up the beautiful work!